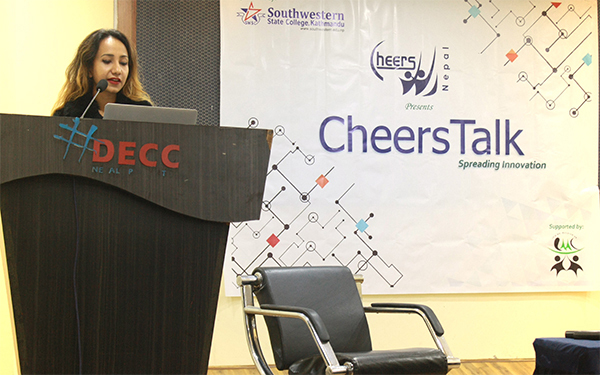 Cheers Nepal, a youth led organization organized 37th session of the popular programme, Cheers Talk, with Miss Shiwani Neiupane as the Innovator to talk on her Innovation in DECC Hall (4th flood of United World Trade Centre), Tripureshwor in the mass of over 100 youth. 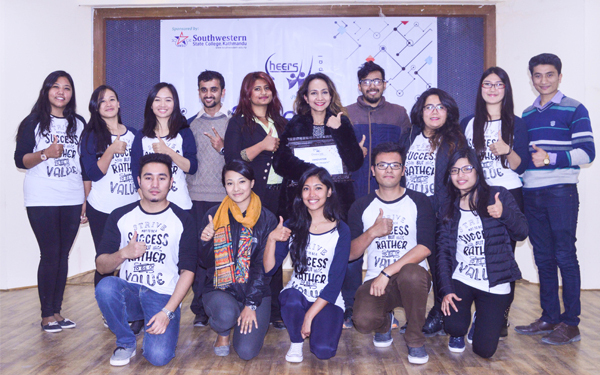 This program was sponsored by Southwestern State College, Basundhara and proudly supported by Prime Entrepreneurial Management Club of Prime College, Nayabazar, Kathmandu. 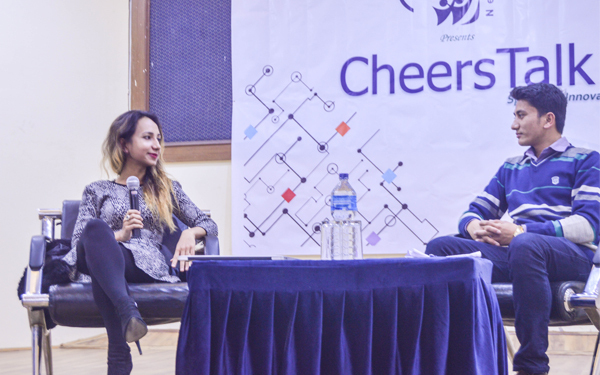 Cheers Talk takes place on the monthly basis in Kathmandu. The programme comprised of two main phases. The first session was inclusive of formal Welcome speech by the Chairperson of Cheers Nepal, Pem lamichhane who motivated youth though stories of Anne Frank and Braine Anderson. Then, Madan Tripati made the whole hall laugh with his caricature he did for leading political figures and other comedy characters. Then, Mahima Hamal gave the presentation on Women Empowerment. It further included the musical peformances of Kushal Darji and Amrit Gurung. 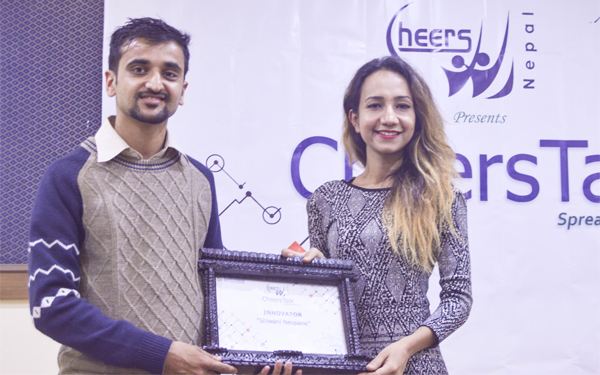 The program was hosted by Dinesh Thapa, Vice-Chairperson of Cheers Nepal. On the second phase, Shiwani Neupane shared her Innovation. Writer Shiwani Neupane has asked all the youths to not to let failures define them. Talking amidst a programme she instead asked all to take failures as lessons to perform better in their life. Neupane is the writer of two books, Monika: Pieces of Perfect(2012), and Crossing Shadows(2015). A graduate of Columbia Journalism School, many of her op-eds and articles have appeared in various national and international publications. In the programme, she shared about the various failures she had to go through in her life, and how she coped with. During her undergraduate years, a professor had asked her to drop her English Major, as he always used to see Neupane reading books on Political Science and International Relations. But, that advice infuriated her as she was sure that she was way ahead of her classmates. And, the professor’s statements angered her to an extent making her think, “How dare could someone to tell me that I am not capable enough to be a writer, as I was very much aspired on English literature and writing, apart from political science.” She was angered when the professor told her to leave the field she loved the most. And, with that anger, she pursued the syllabus with her full energy. Soon after graduation, she was inducted into the International English Honors Society in her college. She still remembers that day. “That day was quite a contrast for me, from being told that I can’t study English Major, to being inducted into the society. I was very happy that day,” she shared. “Had I accepted my professor’s advice and dropped my major, I wouldn’t have been able to make this far in literature,” she said, advising the youths present in the programme to not to take advices blindfolded, instead think on their own. Giving examples of some of the superheroes, from Anuradha Koirala to Pushpa Basnet and others, she said that had they given up in their first failure, they wouldn’t have become what they are now. She further said that how to handle a failure and move ahead is what is really important. “But, failure also does something well. It gives us an opportunity to find a solution, and makes us sturdy instead,” she added. Sharing about writing of novels, she said that it’s countless hours of writing, editing, and more. “The journey is very long. And, there are also moments of doubt whether it really ends up being a readable book or not. But, you should continue if you are really passionate about it,” she advised. She is of the opinion that one shouldn’t be too much focused on the goal, and future, and life-plan to an extent that one forgets to enjoy his/her present. Responding to an audience question about writing her first Novel, Monica, she said that the book is the story of a billionaire’s daughter, and the idea of writing the book came when she was studying abroad and was imagining how the life of Monica would be like. “That time, 2010 World Cup was running. And my brother challenged me that I can’t do anything in my life. I got angry hearing that, and wrote the Novel out of that anger,” she shared. Taking about writing, and sustaining one’s life through the profession, she shared that as the market for English books in Nepal is too small, we’re not there yet. “It’s more like impossible if we think of sustaining our life by writing English books here,” she said. “But, those writing in Nepali language have been making it. Added to this, if you are publishing from a foreign publishing house, then it’s also possible, as they pay handsomely,” she added. Sharing some tips to be a good writer, she mentioned that one must be a good reader, and should find time to read books. “I read the news in the morning, and read books before I go to bed at night. Also, I do take a book along wherever I go so that I can read whenever I have free time,” Neupane shared her reading habits.